In order to improve operations and competitiveness, businesses are increasingly using contract management software. This article will cover the actual challenges on the market as well as how blockchain technology and KCS is able to improve and solve these issues that are currently affecting the whole process. If you are not familiar with contract management, we advise reading [Contract Management: How It Operates & its Current Problems] for an overview of the system. Silo mentality is one of the main challenges faced that leads to inefficiencies in operations. Various databases are spread out within the company and silos arises among the structural departments. Blockchain breaks silos with a unified database so that everyone in a company is engaged not only in the particular department’s targets but in the overall mission of the company. Multiple versions of truth within a company and across client-supplier relationships lead to inconsistencies and the need for regular reconciliation with high costs. 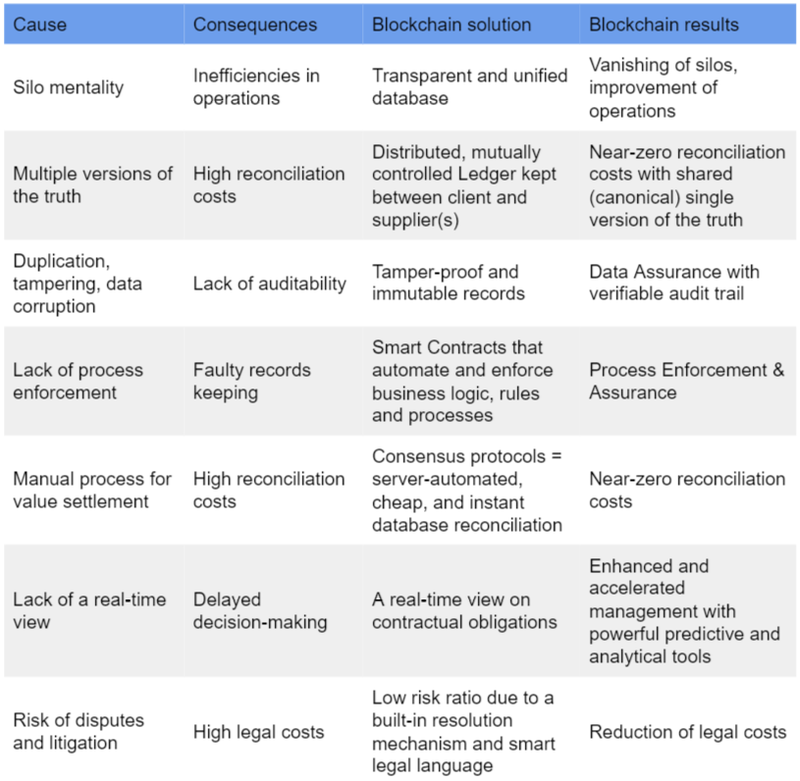 Blockchain brings about a distributed, mutually controlled ledger kept between the client and supplier, resulting in near-zero reconciliation costs with shared (canonical) single version of the truth. Duplication, tampering and data corruption arise within companies that even already use contract management software. Multiple copies and versions of documents are created which lead to difficulties in finding the original data. Blockchain brings data assurance to the next level with tamper-proof and immutable records along with a verifiable trail. Lack of process enforcement originated by fuzzy processes such as calls and emails causes faulty records keeping. Blockchain utilises smart contracts that automate and enforce business logic, rules and processes. Manual process for value settlement is always bound with high reconciliation costs. Blockchain solves this issue by using сonsensus protocols and server-automated, cheap, instant databases. Reconciliation costs are cut almost to zero, excluding the cost of running the nodes and blockchain which are negligible when building a private chain. Lack of a real-time view on management efficiency brings about delayed decision-making. Blockchain allows for the opportunity to view in real time contractual obligations on the distributed ledger. Enhanced and accelerated management with powerful predictive and analytical tools can then be implemented. Risks regarding disputes and litigation appear in contract management systems causing high legal costs for both parties. Blockchain, on the contrary, has a built-in resolution mechanism and smart legal language. Disputes disappear or take little effort and money to resolve. This year we have been developing and testing the implementation of a blockchain-based contract management system for a Fortune 500 company in the pharmaceutical industry. We’re now ready to release and discuss some details of our solution with the public. We have put much effort into resolving the aforementioned problems in current contract management systems. We noted that reconciliation times and disputes were the bottleneck issues of our client’s contract management system. We leveraged the power of blockchain technology to provide a contract management system with near-zero reconciliation costs as well as user-friendly and natural dispute processing. As a result, our customer reduced costs on maintaining their contracts. Konfidio has created solutions for unsolved business challenges with our Production-Ready Enterprise Blockchain Systems. 1. Secure integration of Blockchain with Corporate & Identity Access Management (IAM). 2. Exposing complexity of blockchain system to end users. Our Solution: Use of KCS enterprise blockchain systems to abstract complexity and provide high quality, easy to use interface to end users. Our solution: Konfid.io Smart Contracts and Blockchain lifecycle management tools and processes. Our solution: Konfid.io Blockchain Analytics System creating a secure caching layer and queryable data structures. 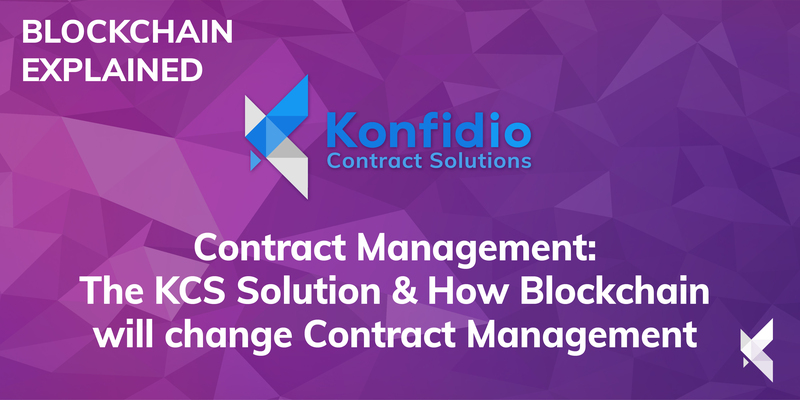 Konfid.io Contract Solutions — a blockchain system for end-to-end management of Client/Supplier contracts. Each organization has their own blockchain nodes and their own enterprise system to interact with the private chain. The system creates one jointly managed single-source of truth. This then eliminates the need for separately managed records and expensive, error-prone reconciliation processes. Through the order management system, the parties execute their contractual agreements in a seamless manner, that automatically enforces the agreed terms. The client is able to place orders defined within the contract, which then trigger the cross-organizational processes and financial obligations throughout the order lifecycle. Each user has a view on the system that reflects the particular role of the individual and the organization. The order lifecycle follows clear governance rules and triggers integrated value settlement obligations. Allowed actions across the order lifecycle follow the terms of the contract and are enforced automatically by the system. For example, only the client is allowed to request the decommissioning of an order. The contract shown has two payment obligations that are triggered once the supplier deploys the order — a one time fee and a monthly service charge for the duration of the order being deployed. This is automatically managed by the system through the blockchain smart contracts. The integrated dispute management process allows for seamless and transparent handling of any errors or disagreements. Disputes are directly linked to proposed resolutions and can be integrated into financial payments. The counter-party is able to either accept the proposed resolution or provide a counter-proposal. This allows for transparent, auditable and effective dispute negotiation and resolution. The dispute process keeps any disagreement isolated and does not impact the rest of the contract execution. Automatic real-time value settlement provides transparency, accuracy and efficiency. Real-time calculation of financial obligations based on single-source of truth from the smart contracts allows for complex, yet modular, payment algorithms (i.e. monthly variable pricing based upon discrete volume bands). Various financial arrangements can be managed within the system(e.g. pre-payments with true-up settlement shown on the left). A common view for all parties on financial obligations is provided, eliminating the need for back-and-forth reconciliation prior to invoices. Pro-forma invoices are automatically generated. Comprehensive user authentication and authorization, with end-to-end RBAC and enterprise identity integration (including Active Directory), is built into the KCS system. The complexity of managing blockchain identities for end users is abstracted for clarity and ease of use. Each organization can manage their own agents (i.e. employees) with detailed Role-Based Access Control, which is enforced end-to-end from the UI through smart contracts. Integrated enterprise blockchain identity management gives each company secure control over the identities of their users. Each user and organization has a unique identity on the blockchain (providing clear transparency and records of who did what and when). Integration into enterprise IAM systems, such as Active Directory, allows for SSO and comprehensive enterprise identity management without duplication of efforts. Integrated analytics and business intelligence processes give management real-time insight into contract performance and financials. The KCS system enables the organization to focus on optimizing contract expenditure and performance instead of day-to-day “keeping the lights on” basic contract operations. Moreover, dashboards can be customized to particular business needs. Stay tuned for further updates! Meanwhile, don’t hesitate to contact us at talktous@konfid.io to schedule a demo or learn more about how the system could work for you.